Now that recreational marijuana is legal in four states and the District of Columbia, the once vilified weed is seeing growing acceptance alongside other recreational intoxicants like wine and beer. So why shouldn’t people learn to appreciate and discuss pot the same way they would a fine wine or stellar brew? With that in mind, the company Cannaroma has launched a crowdfunding campaign for their Cannaroma Cannaisseur Collection Marijuana Tasting & Aroma Kit, billed as “the world’s first all-inclusive kit designed to educate everyone – experienced or not – on the aromas and tastes found within the vast array of cannabis strains available today.” And they stress that “no actual cannabis plants were harmed” in the kit’s production—that is to say, it’s completely legal anywhere in the US. Similar to a wine education kit, the Cannaisseur Collection comes with ten liquid smell vials featuring an array of aromas you might find in different pot strains. Additionally, it has ten “vapor taste cartridges,” allowing users to actually vape different pot flavor components, testing them out on their taste buds without ever getting any sort of buzz. I got a preview of one of the kits, and though I am not much of a marijuana expert myself (don’t worry, mom), the kit was interesting and informative. The vials and vapors presented distinct smells and flavors, and the included flashcards provided a clear mix of scientific and household terms. Beyond its educational purposes, it could certainly do well as a conversation piece for smokers – to whatever extent you are able to focus on a specific conversation. A campaign contribution of $100 gets backers a voucher for a kit via Indiegogo. (Apparently, Indiegogo wouldn’t let them sell the kits directly through their site; Kickstarter, who considered the kits “drug paraphernalia,” wouldn’t accept a campaign for the kits at all.) 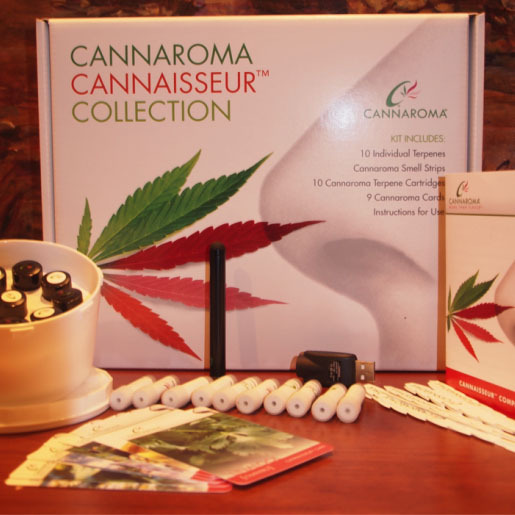 And unlike other crowdfunding campaigns, Cannaroma says their first round of kits is completed and ready to ship. They’re hoping they might be able to get some out in time for Christmas. It’s a fitting gift for under the tree: “Pine” is one of the included flavors and aromas. You can find the Cannaroma campaign here.